Home/Daily Post/Punjabia De Karname/New York :- Amrik Singh Chases Armed Gunman | He Took His Shoes And Chased The Armed Robber Out Of His Store. Amrik Singh was being robbed at gun point when suddenly his instinct caused him to chase the robber away. Initially, Amrik Singh was ready to give the robber the cash but suddenly he took his shoes and chased the armed robber out of his store. The robber was described as a 5’10″ white male who came inside the Route 9 Mini Mark at Staatsburg, NY with a shotgun and wearing 2 masks. 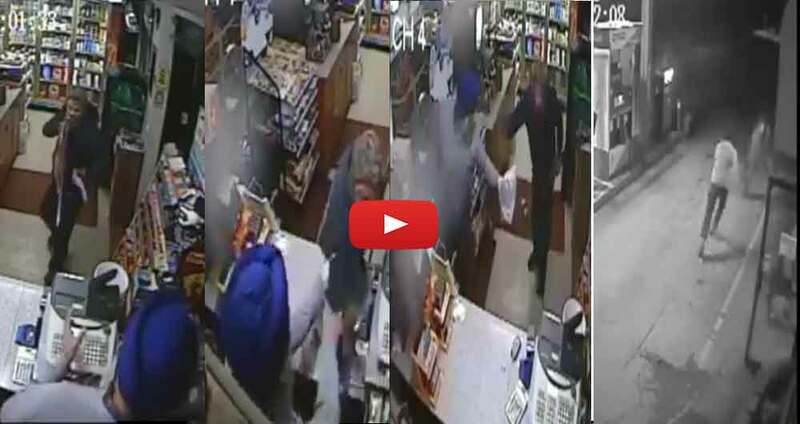 While Singh chased the gunman out of the store, the man was able to fire a shot at the feet of Singh. The man is still on the loose and police has released surveillance video to identify the suspect.